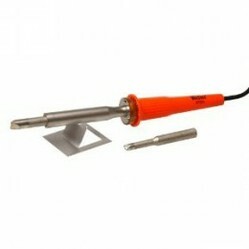 A soldering iron is a useful small hand tool, used for a myriad of applications. The five best soldering tools are reviewed and compared. A soldering iron is a great small hand tool, used by hobbyists and professionals alike. In the world of industry, they're found in the hands of electronic engineers, used for soldering circuit boards and electrical components. From a hobby perspective, they're used in a myriad of ways - jewelry making, mini-stained glass art work, lamp work and more. One model that's sometimes considered is a cold heat soldering iron but - soldering tools were designed to work with heat to fuse metal, therefore it's advisable to opt for the standard heat driven models. The five best buy soldering irons are featured below. All are sold at a discount price, each one is highly rated and will give a great return on the purchase price. This is the best selling soldering iron and will set you back a little under 12 bucks. It's an entry level model, best used for small tasks and anything none-industrial. That said - it works. It's a good quality solder iron, heats up rapidly to its maximum temperature of 750F, and the handle stays both cool and comfortable. It's a 25 watt/ 250v iron, has a stainless steel barrel and the price includes a range of accessories: three tips (nickel plated), an MT1pencil point, an MGT3 chisel, one MT2 screw-driver, a stand and a coil of solder to get you started. In all, a good starter kit, inexpensive, nice quality and one to buy for crafters and similar. This is another quality soldering iron and comes in at under ten bucks. It's 60 watts, rapidly heats up to 860F and is a nice all.round quality. Lightweight, good comfortable grip to the stay-cool handle, this is another well made starter iron that will come in for crafters and hobbyists alike. The tip is a long lasting type - nickel plated and should take some use before it requires replacing altogether. This one's maximum temperature and build makes it useful for those that enjoy making small stained glass projects, jewelry or working with circuitry and small repairs around the home. Durable, user-friendly and sold at a price low enough to give this one a solid thumbs up. This is the best selling soldering gun and great for electronics and professional related tasks. It delivers more heat - the maximum temperature is 1020F, and despite the increase it heats up in around six seconds. You can swap between the watt output - low 100 or high 140 - with the trigger switch and the overall design makes this one good to hold and work with. One its handier features is the dual lights, which are great for precision work or for when you need to work in a dark spot. The full set includes the soldering tool, a soldering tip, a coil of solder, one cutting tip and more. A good quality soldering tool, lots of additional accessories and all for less than thirty dollars One to buy. This is a professional soldering iron and a five star rated product. It's lightweight, portable and powered by butane gas - which lasts for around one hour per use. You ignite the gas by way of a piezo button and from pushing the button, it takes under sixty seconds. You can alter the output between 25 and 75 watts and refilling the gas takes seconds. The kit includes a variety of associated accessories - five soldering tips, tray, sponge, stand/holder, several other shapes and types of soldering tips and it all comes packed in its own sturdy little case. It's great for pro use, as well as a myriad of other soldering tasks and is a highly recommended cordless soldering iron. Great price, great buy. This is the best rated stained glass soldering iron and is designed specifically for the working on creating stained glass projects. It's powered by 80 watts and heats up to 900F - which is perfect for its purpose. The barrel is manufactured out of stainless steel and the handle stays cool, no matter how long you use it. The grip is a comfortable one and it delivers precision results time and again. It comes with a stand, and two different tips - and really does create flawless seams on every application. The cord is a great length - 6 ft in total, which allows you to freely maneuver around the project you're working on. A superior solder iron, the price reflects the quality and design - worth every cent. Non-Temperature Controlled; 80 W; Temperature Range: 900 Deg. F; Cord Length: 6 ft.